Everybody's favorite Charlie Chan Chicken Pasta is the best pasta in Yellow Cab's Menu. Composed mainly of Tender chicken strips, shiitake ( 椎茸, シイタケ) mushrooms and roasted peanuts sauteed in a spicy oriental sauce garnished with spring onions. Naku, I am telling you, once you try it, hahanap hanapin mo talaga! I have always love Yellow Cab's New York Finest and Dear Darla Pizza, so imagine my happiness when I was invited by Yellow Cab to try their latest offering. It was 57 days to go before Christmas! Driving during "ber" months and just before the long weekend when people are all in the streets are not fun at all. But all our stress went out of the window when we had a taste of Yellow Cab's newest offering they called "Christmas Fleet"! Santa's giving away presents on a Cab this Christmas! Yellow Cab Pizza Co. has a special treat for everyone this Christmas season! Make your holidays even more special with their Christmas Fleet. Just call 789-9999 or order online at www.yellowcabpizza.com. Look, walang bitak bitak and meatballs ng Yellow Cab. Yes, guys and gals, inside every order of Yellow Cab's Spaghetti are two large meatballs baked and simmered in a chunky red wine tomato sauce. Super sa sarap! As in mapapa sigaw ka ng " Deliciouso"! My favorite Charlie Chan Chicken Pasta taste just right! No wonder, Charlie Chan Chicken Pasta is included in Yellow Cab's Christmas Fleet! 18" Barbecue Chicken Pizza, so yummy talaga! Eating Pizza is a lot more fun when shared with friends and family, specially this holiday season. NEW Serendipity Ice Cream will be available in green tin can by November 2012. Abangan! A smooth and creamy New York Cheesecake-inspired treat with chewy graham cookie bits, a perfect dessert for the holidays. Very delicious! We had a taste test on a Saturday at Yellow Cab Eastwood. By Monday, I was back at Yellow Cab-Trinoma. I bought two (2) tins of this Cheesecake Serendipity Ice Cream at Php 140 each. That's how addicting this Yellow Cab Ice Cream is. I super love this ice cream! This New York Cheesecake-inspired treat taste just right! Not too sweet, not too bland! I super love Yellow Cab's Serendipity Ice Cream. ( If only they could make the name shorter, sigh!) lol. Capped your meal with Yellow Cab's Coffee for only Php 45.00 Super Sulit! Bonding at home with your family, office mates, college barkada, churchmate will never be complete without Yellow Cab's Christmas Fleet. Want to surprise your family? 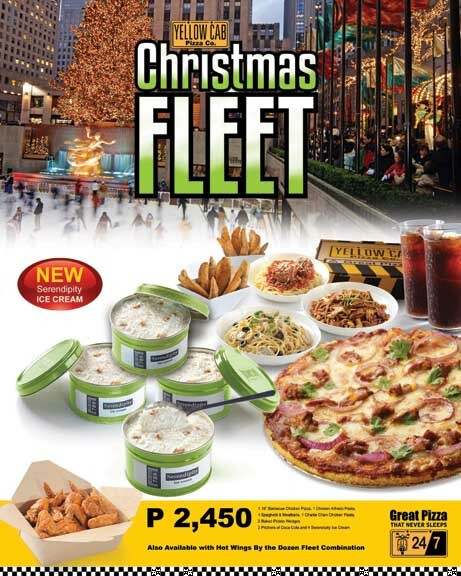 Yellow Cab's Christmas Fleet promo offers cool packages for groups of five (P 1,300) and ten (P 2,450) all the way until January 15, 2013, for dine-in, take-out, and delivery. Yellow Cab's New York style pizza is one of my favorite. Hey, thank you Gerald for the invitation. Thanks to Yellow Cab's Marketing Manager and the rest of Yellow Cab's Marketing Staff, as well as Yellow Cab's courteous crew at the Eastwood Citywalk branch. So what are you waiting for? Head on to the nearest Yellow Cab store and avail of Yellow Cab's Christmas Fleet.